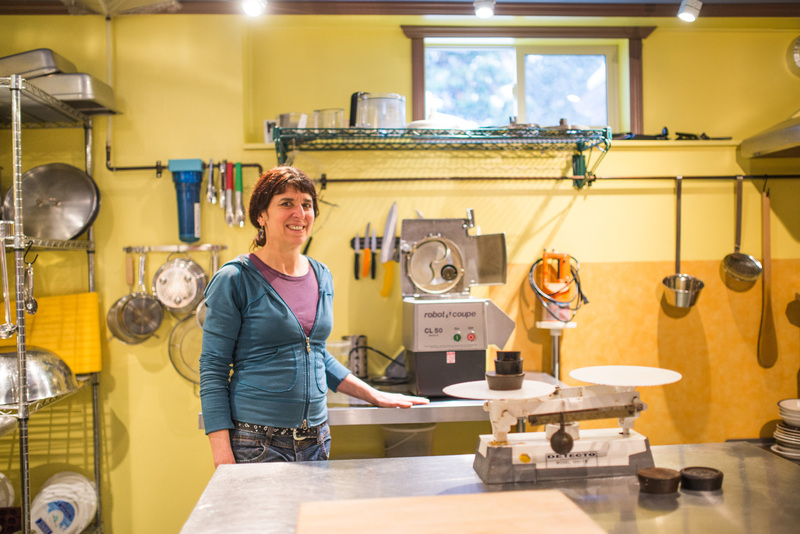 Valerie Sanderson, of Valerie’s Fermented Foods (formerly Soups in Season), makes her products right here in Uphill, Nelson. Valerie is incredibly dedicated to sourcing her ingredients locally. She sees her creations as a vehicle to bring local organic food to her community and as an avenue for her to support local farmers. Valerie supplies the Co-op with delicious lacto-fermented sauerkrauts – in traditional, spicy red cabbage and curry flavours. She also makes lacto-fermented carrot and daikon pickles when there is a surplus of carrots and daikon in the fall. Read on to learn more about this great True Local supplier and the amazing farmers who supply her raw ingredients! Who is the creator at Valerie’s Fermented Foods? Valerie Sanderson, with support from her husband David Beringer (who also runs Uphill Bakery out of their home-based commercial kitchens). 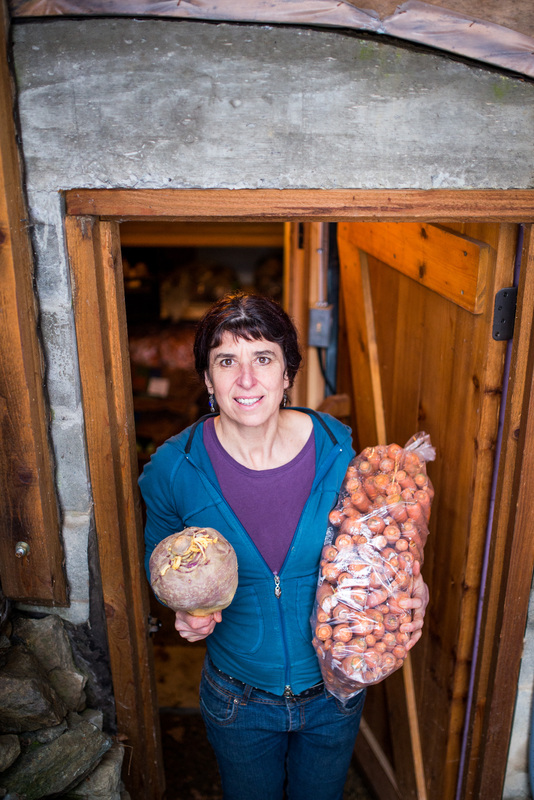 Valerie and her root cellar full of local veggies! Soup, sauerkraut and other fermented foods. These products are mainly organic and the ingredients are sourced significantly from local farms. Why is it important to you to use local ingredients? A reduced carbon footprint of our ingredients. In my opinion, downscaling our energy use is one of the most important things for us to be doing in this day and age. Connecting to the land and with our farmers. I love handling food when I have an image in my mind of who grew it. When we buy food, we have a relationship with whoever is growing it, even if we’ve never met them in person. By buying local, this relationship is with someone who is actually a member of our community. Buying local keeps financial resources in the community, expresses appreciation to our local farmers, and helps give them more immediate feedback for what they are doing. Part of this relationship is that the local farmer can get to know what specifically works for a food processor and can use them as an outlet for produce that might be more difficult to sell to the public. For example, parsnips that are 2 feet long, cabbages that weigh 10 pounds, garlic that has broken into cloves and potatoes that have scab. Freshness. Local ingredients are fresher than ones that have traveled a long way and are more likely to have been picked at their peak, making them tastier and more nutritious! I became involved with local food processing because I was looking for a way to help to relocalize our food systems. Basically I got involved in the food industry so that I could buy local food from local farmers! How much local produce do you use and who do you source it from? In the last year, 65 per cent of what I spent on produce was for local items. Every year the percentage increases as I get to know the possibilities and new farmers start to make things available. As well as being local, these suppliers are all certified organic! How does incorporating local ingredients impact your business? The business that I took on – soups and sauerkraut – lends itself quite readily to using local ingredients. The main issue then becomes about storage. My husband David and I built a root cellar in our back yard and without it, my business would be a completely different thing. In the past few years, California has gone through a number of unprecedented weather crises. As I watch the price of carrots double for two weeks and then come back down again, I feel relieved to go out to my root cellar and see six bags of carrots sitting there waiting for me and allowing me to weather the fluctuations. Do you have any specific goals/dreams with regards to making more local products or your existing products more local? 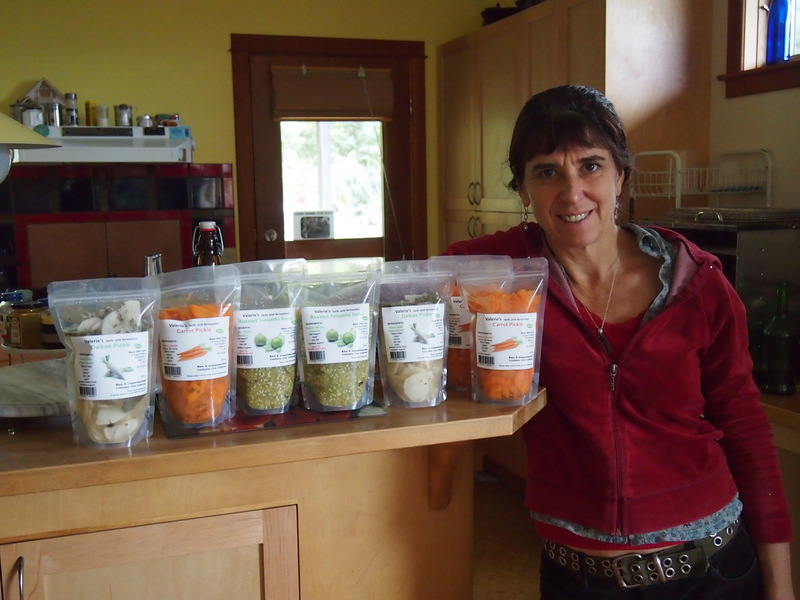 In the autumn of 2015, I started making new seasonal fermented vegetable products exclusively from local vegetables. These are a daikon pickle and a carrot pickle. I love doing demos with these products because they are very delicious and people are surprised by how alive they taste! One of my goals is to get a divorce from California before it divorces me. At this point (May 2016) I have reduced my “Down South” vegetable purchasing to tomatoes, eggplants, peppers, celery, broccoli, corn and a few bags of onions and some garlic in the late spring. We have added an energy-efficient cooling system to the root cellar and increased other storage areas so I was able to stock up on many things in the late spring that will take me through to the next growing season. Another goal that I have is to do more to publicize which products are using mostly ingredients from local farmers by providing information about and pictures of the farmers to the eating public. If you could share a message directly with Co-op members/customers, what would it be? When I look at the issues in front of us today — climate change, the plight of the bees, pollution, the fact that we are developing the tar sands and building pipelines to move dangerous chemicals around — I think that people need a way not to get discouraged and disheartened. Making the choice to focus our energy on increasing the amount of food grown, harvested, stored and consumed locally seems to me to be a very worthy venture in these confusing times. Doing so is a great way to decrease our personal carbon footprint and in the process we build meaningful relationships with other members of our community, improve our health and fill our lives with lushness and beauty. Before getting involved in local food systems, I felt like I was on a ship heading towards an iceberg and people around me were rearranging the furniture and getting their hair done. Since throwing my lot in with the other foodies I feel as though I am on a life raft surrounded by beacons of hope in the form of farmers, gardeners, health food stores, fellow food processors and everyone who cares enough to buy thoughtfully and ethically. We are all in this together. Thank you for buying local.